What if you could create, share, and update your product roadmap in one place? Everyone could see you’re tackling the right priorities. Start planning your product roadmap with this template. Wouldn’t it be great if planning your product roadmap were as easy planning as a road trip? Unfortunately, many product managers are forced to draw and redraw the roadmap quarterly. Communicate timelines and strategy. It’s important for everybody to know what launches will go out, when, but it’s also helpful for them to know why and how. Use your roadmap to show schedules and strategy. Share your roadmap. Share your roadmap with all your stakeholders and keep everyone up to date by planning and managing it in the same tool. Everything, and everyone, stays updated as you make changes and adjustments to your plan. Show your roadmap in different ways. Visualize your roadmap by creating it as a timeline or calendar, then further sort your milestones by category, priority, or PM. With Asana, you can toggle views so everyone can see the plan in the layout that makes most sense to them. Keep track of multiple product lines. 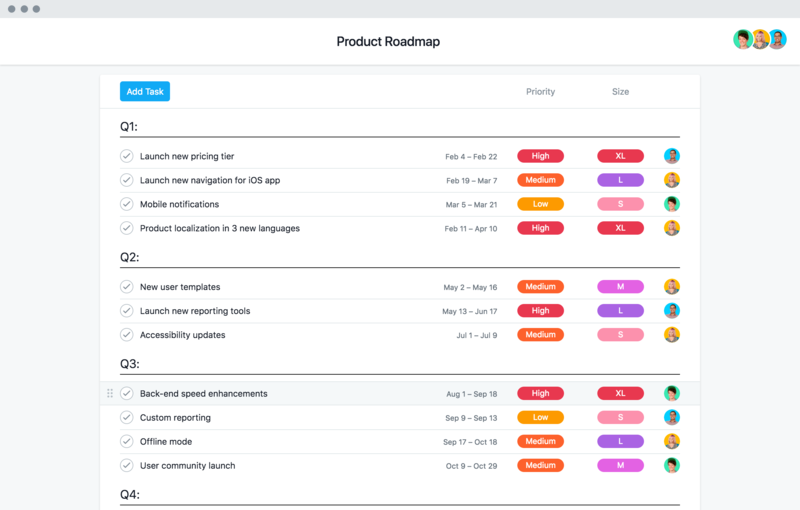 Keep a roadmap of all your product lines in one place to get a full view of your business and product priorities. In Asana, use Portfolios. Excel is great at pivot tables, but not at pivoting project plans. Here's a better alternative. The Sonder product team walks you through their entire product development process in Asana. What five things can you do to build a better roadmap? Find out in our blog. A template gets you started, but a free Asana Premium trial is what keeps you going.